With a BBC iPlayer VPN you can watch iPlayer abroad. A VPN works by concealing your location and giving you an IP address in a country of your choice, such as the UK! The best part is, it takes less than 5 minutes to set up. A VPN lets you unblock BBC iPlayer by routing your web traffic to a server in the UK. Unfortunately, the BBC blocks the vast majority of VPNs, which means that not every service is suitable. The good news is that we have the inside knowledge you need to unblock iPlayer successfully. Our experts have tested all of the VPNs that work with iPlayer, narrowing the list down to the Best VPNs for iPlayer in 2019. The Table below will give you a quick look at the best VPNs to unblock iPlayer. To compare them in more detail scroll down. With each year that passes fewer VPNs manage to unblock iPlayer. The BBC is getting better and better at blocking VPNs, which means that you need to be extra careful when choosing one. It is not cheap or easy to bypass the BBC firewall so most VPN providers have stopped trying. Thankfully, some world class VPNs still know how to let you watch iPlayer! Our recommendations have proven that they have ways to fight iPlayer VPN blocks, always managing to bypass the iPlayer proxy error. These are reliable, which means you don’t have to miss your favorite shows. In addition to guaranteed iPlayer access, these VPN providers have super fast UK servers that will let you Watch BBC iPlayer in HD without buffering. We have thoroughly tested all the VPNs that we recommend in this guide. They all work perfectly. However, they all have slight differences. Read our in-depth comparisons to select the best iPlayer VPN for you. NordVPN is one of our top choices for watching BBC iPlayer because it offers fantastic value for money! Speeds are fast enough to let you enjoy HD shows and you can use the VPN on an incredible six devices at the same time. The software is streamlined and intuitive, which means you can be streaming your favorite content in seconds. With clients available on all popular platforms, NordVPN is a cost-effective solution for streaming BBC iPlayer on the go. PrivateVPN is a regularly praised as great all-rounder. The provider has proven itself to be good at unblock a wide range of content, including iPlayer. It is fast, efficient and offers an extremely reliable service. It is a pleasure to use the software, and has all the important security features you would hope for. Private has a robust zero logs policy and, considering polished the product is, comes in at a really attractive price. Why not make use of the 30-day money-back guarantee and see what all the fuss is about. Cyberghost has taken the industry by storm in a short space of time by offering a great product at a great price. Cyberghost is a superb VPN for unblocking UK content. It has a choice of fast UK servers that are capable of unblocking iPlayer and are up to the task of streaming in HD. Software is available for all major platforms and is very easy to and the VPN is secure thanks to military-grade encryption. With a 30-day money back guarantee, an attractive price and a robust offering, Cyberghost is certainly one worth considering. ExpressVPN is a popular service thanks to its blazing download speeds, reliable servers and ability to consistently unblock the world's most in demand content. The VPN can be used on three devices simultaneously and while this isn't as many as some other providers, is usually more than adequate for most streaming needs. VPNArea is an excellent Bulgarian provider that is a superb choice for streaming. It is a relatively cheap service when purchased yearly, and it will let you stream not only the UK's iPlayer - but many other channels from around the globe. VPNArea has solid software for all platforms, and they all come fully equipped with what you need to keep your data private. DNS leak protection and a killswitch are included, and the VPN keeps zero logs. Finally, and most importantly, VPNArea provides reliable and fast connections for streaming without buffering. A great allrounder. Why do I need a BBC iPlayer VPN? A VPN provides digital privacy with strong encryption: This stops your ISP from knowing what you do online. VPNs conceal your real location: This allows you to pretend to be in a remote location of your choice. When connecting to a server in the UK, you get a UK IP address. This makes it seem like you are a UK resident, which lets you unblock iPlayer for free! The important thing to understand is that VPNs are originally for digital privacy, not for unblocking iPlayer. That means 99% of VPNs can provide you with a UK IP address but it doesn’t necessarily unblock iPlayer. To watch iPlayer abroad choose one of our recommended VPNs to avoid disappointment. For more information about how VPNs work, click here for our VPN beginner's guide. Is BBC iPlayer blocking VPNs? Copyright holders license TV shows to the BBC, and they do not want anybody outside of the UK market to see those programmes without them being licensed officially in those territories. Companies make money from licensing shows around the world, so copyright holders need the BBC to do everything it can to block people using VPNs. Even original content produced by the BBC can be licensed overseas, so the BBC has its own reasons to stop VPN users accessing its content for free. The BBC understands how hard it is to stop the individual people who unblock iPlayer. Those viewers may be located anywhere in the world and the BBC has no actual power in a foreign jurisdiction. For this reason, the BBC concentrates all its efforts on blocking VPN services. The BBC blocks VPN IP addresses by monitoring IP addresses for unusually high levels of activity. If a huge number of people use a single IP, the BBC can deduce that it is a VPN server. 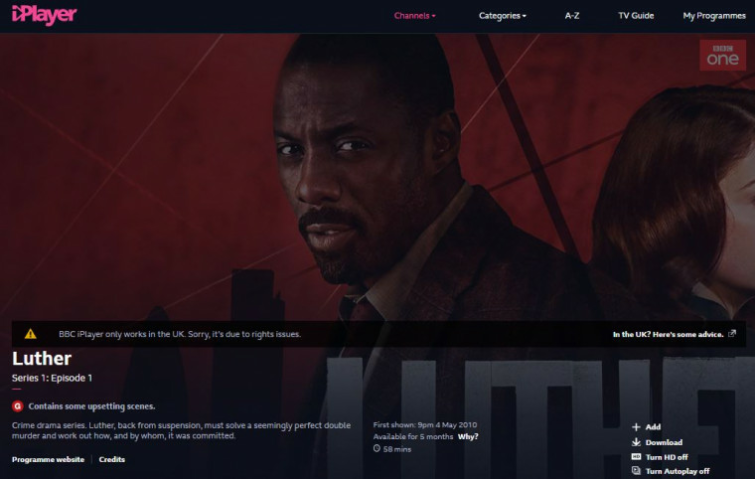 If iPlayer has blocked your VPN, it is likely that there is nothing you can do to fix it. Your VPN may have given up attempting to keep providing access to iPlayer. If this is the case, you need to cancel your subscription and choose a VPN from this article. Update your browser’s geolocation data settings. Flush your DNS cache - For Windows VPN users type “cmd” in your search bar > Open Command Prompt > Type the following command > ipconfig /flushdns. For Mac VPN users please follow Apple’s VPN instructions as it varies on different versions of macOS. Fix WebRTC leaks by disabling WebRTC, using a WEbRTC block extension, or by disabling IPv6. Get a dedicated IP. Some VPNs provide access to dedicated IPs which are reserved for your use only. A UK dedicated IP should always work with iPlayer, but check with your provider before you pay for it to be sure. Do you need a TV license to watch iPlayer abroad? In the UK, all citizens must pay for a TV license to watch BBC channels both on their TV and on iPlayer. Theoretically, that means every single person watching iPlayer should live in a home with a valid TV license. People living in the UK can be fined if they watch iPlayer without paying for a TV license. However, because you are located outside of the UK, and a VPN provides encryption; the BBC will not be able to tell who you are. Just remember that to use iPlayer you will need to hand over an email address and a valid UK postcode. So use a random postcode generator and a burner email to be safe. Remember: although a VPN may be effective for watching iPlayer without a TV license inside the UK - we can not endorse nor recommend this. If you live in the UK and don’t pay for a TV license you could be fined. Select a VPN from this article and subscribe. To watch BBC iPlayer abroad free - we recommend NordVPN - because it has super-fast servers for streaming in HD. Download the VPN software and install it. Connect to a UK server using the VPN software. Navigate to BBC iPlayer website online. Sign up for iPlayer using a burner email address. Enter a valid UK postcode. Read the T&Cs and continue if you agree. To help you out, we have pinpointed a number of VPNs that definitely do not work to watch UK TV abroad free online. If you want to access iPlayer outside the UK give these VPNs a miss! The VPNs above never unblock BBC iPlayer, even if you connect to their UK server. This is because the BBC has already blacklisted that VPN successfully. On rare occasions, it may be possible to unblock BBC iPlayer with a BBC iPlayer proxy server. However, this is extremely rare these days, and a proxy will not provide the level of privacy that a VPN gives you. What’s more, the BBC has already blacklisted most proxies. Thus, you will likely find it almost impossible to find a free proxy for iPlayer (proxy website or proxy extension). Can I watch iPlayer without a VPN? iPlayer is only available without a VPN from within the UK. Anybody living (or visiting) outside of Britain must use a reliable VPN to get a UK IP address and pretend to be in England. Can you download BBC iPlayer shows? Yes, iPlayer does let people download programmes so that they can watch them offline using the BBC iPlayer Downloads app. This lets you watch a show when you have no internet connection. Downloaded TV shows can only be watched offline for a limited amount of time (while they are available online). Where are iPlayer downloads stored? If you download a programme using the BBC iPlayer Downloads app, the show will be saved inside the software. The app tracks the expiry date and automatically deletes it. Can I listen to BBC radio abroad? You can use a VPN to listen to BBC radio stations online. You can unblock BBC iPlayer Radio with any VPN in this article. All BBC radio stations - BBC Radio 1, Radio 2, Radio 5, - can be accessed with a VPN. Can I use a VPN to access other UK streaming services? Yes. You can unblock other UK-only geo-restricted players and streaming services - all become available with a VPN. Take a look at the relevant guides for more information; ITV VPN, VPN for 4od, RTÉ VPN and SkyGo VPN. Can I use a VPN router to access iPlayer? Yes, With a VPN router you can connect all the devices in your home to a UK server automatically. This will let you watch BBC iPlayer on devices such as a smart TV, a set top box, Apple TV, a games console - or any other devices that you can’t directly connect to your VPN. For more information, take a look at our VPN routers page. Can I chromecast BBC iPlayer while using a VPN? By default, Chromecast will not work with iPlayer if you unblock it with a VPN. This is because mirroring to Chromecast causes iPlayer to switch to Google DNS. However, a fix has been discovered on Reddit. Will a VPN unblock BBC iPlayer in Europe? Yes, our VPN recommendations can unblock BBC iPlayer in any European nation. Our VPNs also unblock BBC iPlayer in the US, or anywhere else around the globe. Can I unblock iPlayer for free? Reliable free VPNs are very rare, and very few will unblock iPlayer. For see our free VPN services guide for more information. However, please be aware that free services restrict download speeds and have usage throughput limits that will make watching iPlayer extremely tricky. I have subscribed to Private internet access(PIA) for several years and if your reason for a VPN is to access the BBC I can tell you I have not been able to access the BBC for 2 years +. For this reason I will not renew my subscription to PIA later this year when it expires. As a footnote, it might be an idea to increase the scope of this review to all UK TV rather than just the iplayer as I'm sure that anyone who wants to unblock the BBC is also interested in ITV hub, All4, My5, TVcatchup and Sky Go. Unblocking ipayer doesn't necessarily mean the others are also unblocked. For example, PrivateVPN and ExpressVPN both unblock Sky Go whereas NordVPN does not. As previosly stated, having a dedicated server just for the BBC, as well as another for Sky, puts PrivateVPN a step shead of the rest in my opinion. I haven't encountered a single problem unblocking any of the aforementioned UK TV services which I think is fairly unusual these days. Warning: CyberGhost tracks their paying subscribers. Excellent article but in my opinion PRIVATEVPN should be number 1. I have trailed expressvpn, nordvpn and privatevpn for the last month and the best by far is PrivateVPN. I live abroad and am particularly interested in UK TV. Privatevpn works flawlessly with all of the UK services like BBC, all4, sky, itv... They even have a dediicated server for the BBC. Expressvpn was good but expensive and only 3 simultaneous connections. Also, their smartdns didn't work on my smart TV (UnoTelly does so the problem is not my TV). Nord was surprisingly poor considering the praise it gets from you and others. Android app in particular just didn't work consistently with BBC. It worked mostly fine with the iplayer app but hardly at all with the web browser ( despite clearing cache etc) and not at all with the BBC sport app. Lots of UK servers but useless and frustrating. Also, Skygo isn't supportred at all. Full marks for PrivateVPN in my opinion. It does what it says on the tin, quite rare these days. Hi Cotts, I wanted to thank you for your suggestion of privatevpn. I, like you have, tried many of the above and as stated by Douglas it is a constant game of cat and mouse. So far I am very satisfied with privatevpn. Well priced and aside from the occasional buffering, works like a charm. Hope privatevpn can keep it up. Hello I use Express VPN but BBCiPlayer is always a step behind and continually blocking the site! Hi Micheal, It is a cat and mouse game, but Express usually has at least one server that works with iPlayer.